The best, most economical way to cool your home is with a CoolBreeze evaporative air-conditioning system ducted throughout your whole home. A CoolBreeze air-conditioning system can save up to 80% on running costs compared to reverse cycle systems. That’s great for summer but for winter the Hearth House Combo pack includes a Panasonic Wall Split for your living area or bedroom to keep you toasty warm. A Hearth House Combo pack will save you around a third of the price of a fully-ducted reverse cycle system to purchase plus save hundreds each year on your power bill. It won’t take long to save enough for a holiday to the Caribbean! 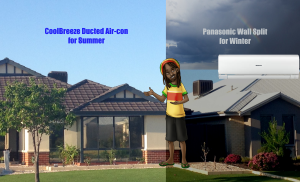 You cant go wrong with two top brands, CoolBreeze and Panasonic, backed by Hearth House’ 35 years home heating and cooling experience. Send through your details to arrange a free in-home quote on a Hearth House Combo.